Leader in peer-to-peer education, delivering informative and empowering presentations on mental wellbeing and physical health . ​The Conviction Group Presentations & Workshops were developed to offer, quality evidence based education with a relatable approach. 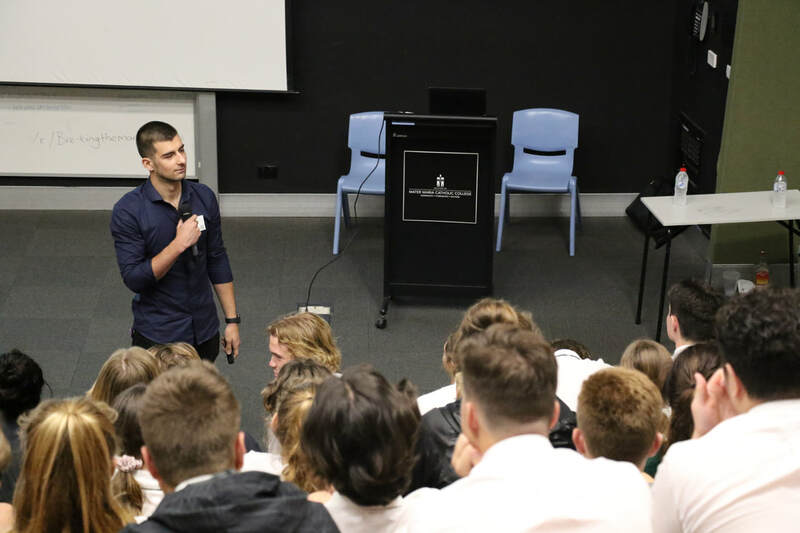 The presentations have been tailored to cover the PDHPE life skills curriculum and the latest wellbeing structures set by the Department of Education. The Presentations & Workshops are aimed to balance cognitive, social, emotional and physical development of the students. They provide students with the opportunity to learn about, and discuss ways of, adopting and maintaining a healthy, productive and active way of life. ​Conviction Group also now delivers the Wakeup presentations, which focuses on decision making on nights out. Through all the presentations our dynamic team of young, engaging male and female presenters have spoken to a combined total of over 20 thousand high school students over a 2-year period. ​The presenters share their personal experiences as a young person to connect on a deeper level with students. With the aim of providing simple tools to help them develop their decision-making processes in a social environment. We offer 1 hour (includes two modules) or 2 hour (includes 4 modules) presentations. All modules are tailored to the needs of the school and their participating students. Conviction Group is a powerful, peer-driven exercise in empowerment and adoption of personal responsibility. Young people in our contemporary society are under enormous pressure from drug and alcohol abuse and mental health. Conviction Group provides a positive and relevant message about how to navigate and thrive through a young life. Your police are very keen to see our youth safe and happy and only engaging with us in a positive way and the Conviction Group team are helping making that happen.